2014 was a golden year for Gold Medal Squared. With literally hundreds of League, District and State Championships won by GMS camp and clinic clients, along with multiple international Gold Medals won by GMS Advisory Staff Members, it’s safe to say that life at GMS is as good as it’s ever been! Back in January, Gold Medal Squared ran our 5th annual coaches clinic at Arizona State University. It’s always great to be in sunny Arizona during the winter months. We had three National Team coaches presenting at the event, along with ASU Head Coach Jason Watson. We will be back in Tempe January 9-11, 2015 for our 6th straight GMS Volleyball Clinic on the ASU campus. In March we hosted a small clinic at Saint Mary’s College in Moraga California. This is always one of our favorite events of the year. First, the clinic has the same feel as the campus. They are both small and quaint which allows us to spend a lot of 1 on 1 time getting to know the coaches in attendance. Likewise, we get to spend time with our good friend and SMC Head Coach Rob Browning. Last spring and summer, we made stops in Southern California, Washington, Utah, Texas, Maryland and Massachusetts. We are always flattered and honored that so many volleyball coaches are willing to invest three full days in an effort to hone their craft. The relationships formed during these events are priceless. It’s no doubt one of the most rewarding things we do at Gold Medal Squared. For the second year in a row we had more coaches come through our Coaching Foundations clinic than ever before! Our clinic lineup in 2015 is similar to our 2014 lineup with the addition of a couple new venues. First, we are thrilled to be hosted by the University of Miami the weekend of January 23-25, 2015 for our 1st annual GMS Foundations Clinic at this location. Jose (Keno) Gandara will be hosting and participating in the event, along with GMS founder Carl McGown. Concordia University in Irvine CA will be hosting our Southern California event this year. We’re excited about this location and to be working with Coach Trevor Johnson and his staff. To view our full 2015 volleyball clinic lineup, click here www.goldmedalsquared.com. This summer was one of the most successful campaigns in USA Volleyball history and Gold Medal Squared was well represented. 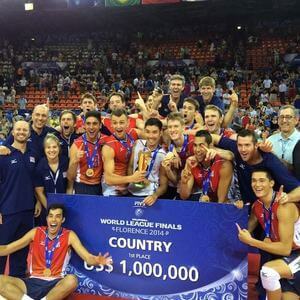 First, GMS Advisory staff members John Speraw and Mike Wall led our Men’s National Team to our 3rd ever World League Gold Medal, by defeating Brazil in a tightly contested four-set match. Not to be outdone, our Women’s National team followed up with their first ever World Championship Gold Medal when they knocked off China in four. This was a major breakthrough for the USA Women. Tom Black and Marv Dunphy (GMS Advisory Staff Members) played important roles as assistant coaches with the USA Women’s team. Congratulations to the coaching staff and the team! Fall is hands down the most rewarding time of the year for our staff at Gold Medal Squared. Not only do we get to communicate with volleyball coaches all over the country about their teams, but we get to hear some amazing stories. State Championships, League, District and Regional Championships, first-time success stories, and more are common during the fall months. There’s nothing better than receiving an email from a new high school head coach who took their program from 2-25 to 25-2 in her first year. We are excited about all of the growth in the game! It’s thrilling to hear that volleyball matches are selling out. Nearly nine thousand fans showed up to watch the University of Washington upset #1 ranked Stanford University. Lots of beach matches were on television this summer and there’s no shortage of volleyball matches that you can stream or watch on all of the major conference networks and ESPNU. The 2013 Final Four matches were packed and we’re looking forward to another exciting National Championship weekend. For those of you attending the AVCA convention, Gold Medal Squared will be heavily involved. BYU Head Coach Chris McGown will be giving an on court presentation on developing defensive systems. We will also have a panel discussion on how to best use statistics when training your teams (and when not to use statistics). You won’t want to miss that one! Thanks again for another outstanding year! We hope to see you soon at an upcoming event. Until then, have a great Holiday Season! Carl, Chris, Tom, Mike, Marv, Jim, Jason, Rob and the rest of the GMS Crew!